Flight Pattern juxtaposes the work of two contemporary artists, sculptor Nathaniel Foley (Findlay, OH) and printmaker Monika Meler (Stockton, CA), who emphasize fragility as it relates to aviation and memory. Monika Meler’s journey as a Polish immigrant to America underscores the visual patterns she creates. As time passes, memories change, distort and blur together. Her layered prints repeat and change direction on top of each other, mimicking the process of remembering. Nathaniel Foley was immersed in the field of aviation at an early age, instilling an inclination to defy limitations. 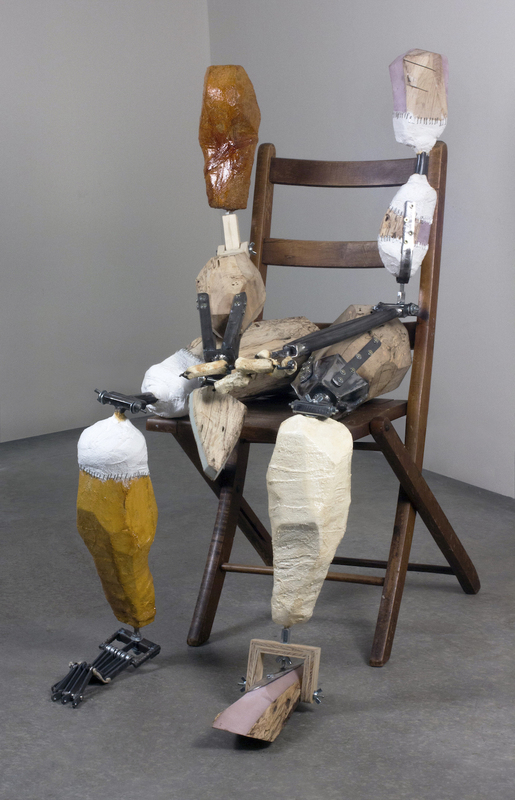 Foley’s delicate sculptural forms, made of various cones, are held together by tension lines. For Foley, aviation dances the line between grace and imminent danger. Potential and Limits: Visions in Encaustic, a group exhibition of the historic medium of encaustic art, includes Danielle Fontaine (Greenville, SC), Patricia Kilburg (Greenville, SC), Michael Ziemer (Piedmont, SC), Roger Bruckner (Taylors, SC), Jess Stone (Piedmont, SC). The artists present various techniques and concepts but all employ the encaustic medium, an ancient painting technique using heat to melt and fuse layers of pigmented wax. In NOstalgia, Theresa Gooby (Beacon, NY) explores the often overlooked and troubled nuances of a past era. 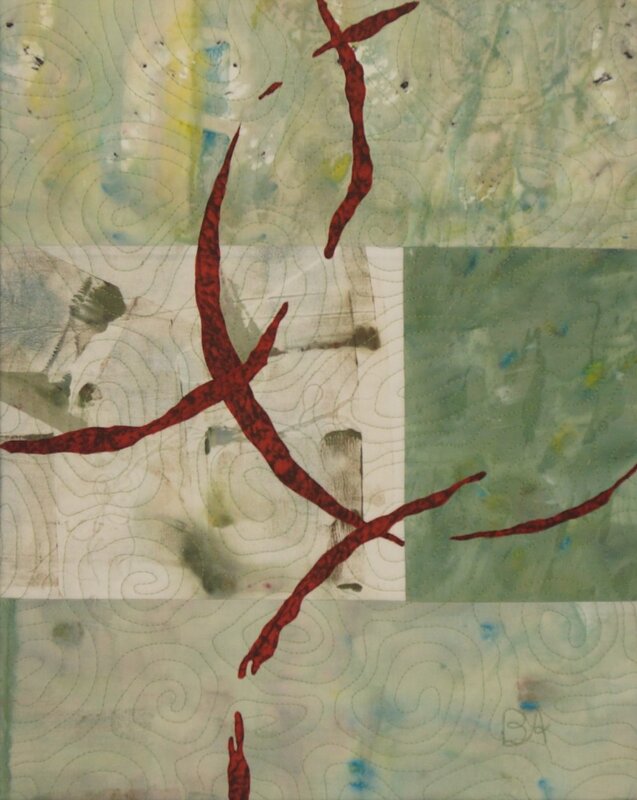 Theresa's work consists of mixed media and encaustic artwork and her work can be found in Gallery B of GCCA's Main Gallery. Textiles: A History of Expression illuminates textiles through contemporary concepts while reflecting traditional approaches to the medium. The exhibition highlights central themes of memory, fluidity of emotion, multi-sensory experience and reverence. Using natural dyeing, meticulous handwork, embroidery, and quilting techniques, the artists invite viewers into thoughtful engagement with their experience. The artists, Alice Schlein (Greenville, SC), Sasha de Koninck (Santa Monica, CA), Beth Andrews (Greer, SC), Kristy Bishop (Charleston, SC), and Meredith Piper (Greenville, SC) re-energize the rich history of textile by continually informing their contemporary practices. In Last Words, Susan Lenz's work focuses on "the accumulated memory inherent in discarded things" (susanlenz.com). She employs the use of recycled materials, hand work and embroidery to create imagery detailing her concepts. Lenz is a full-time artist out of Columbia, SC. She will showcase her artwork in Gallery B. The 2018 Member Show featured individual works of art done by 136 of our members. The Brandon Fellowship Final Show featured works by the 2017-18 Brandon Fellows Charis Jackson Barrios, Olivia Perreault, and Megan Hueble. In the Persistence of the Figure exhibition, the body becomes a vehicle for addressing meaning in the human condition with themes centered around empathy, shame, and consumption. The artwork encompasses multiple mediums including painting, drawing, ceramics, found objects, and sculptures. Artists Brandi Read (Glendale, AZ), Colleen Critcher (Florence, SC), Gill Alexander (Miami Beach, FL), Lucy Bailey (Irmo, SC), and Michael Benvenia (Lancaster, Pa) chronicle their continual experimentation with the boundaries of the human figure. For the artists participating in Material Transformation the major themes of mythology, pop-culture, self-deprecating humor, identity and experience are woven into the physical properties of the work they create. The artists, George Bedell (La Plata, MD), Donte' Hayes (Kennesaw, GA), James Lynch (Travelers Rest, SC), Rob Millard-Mendez (Evansville, IN), and Kathy Moore (Belton, SC), use assemblage and the re-contextaliztion of material to tell stories that are implicitly tied to the transformative properties of process and the abstraction of experience. Making Our Mark brings together seventeen artists of the Studio South painting group. The work included in the exhibition represents the range of techniques and styles that each member contributes to the group while highlighting the love of painting that they share. A multi-disciplinary exhibition featuring the work of Abraham Abebe, David Bogus, Lindsay McCulloch and Laura Mosquera, four artists working in multiple mediums with a common conceptual undercurrent of rhythm and geometry. 22 artists from the Contemporary Printmaking Collective of South Carolina and 22 artists from the Ideas Creation Studio of Taiwan will exhibit together in this international exchange of printmaking ideas and images. Contemporary Print Collective fosters an awareness for original hand-made artist prints by promoting exhibitions, educational opportunities, and encouraging the art of collecting prints. Open to current GCCA Members, the annual Member Show provides an opportunity for the community to see the breadth and depth of work being created by supporting members of GCCA. Not currently a member? Click here to join GCCA today! 'In Sight' is a group exhibition of new work by Greenville based artists Dorothy Shain, Kiah Bellows and Glory Day Loflin. After participating in a class at Penland taught by Alice Ballard last fall, they brought that educational experience back to Greenville to share with their community: Dorothy through collage, Kiah through painting, and Glory through outdoor drawing. Contemporary jewelry challenges the notion of what is wearable, pushing the boundaries between the wearable and the sculptural. The twenty-three artists included in the Wearable Art exhibition consider the history of adornment and how established norms can be broken or rewritten. 17 contemporary ceramic artists from the Southeast (Alice Ballard, William Baker, Daniel Bare, Sharon Campbell, Bob Chance, Diana Farfan, Darin Gehrke, Glenda Guión, Leslie Hinton, Betsy Kaemmerlen, Jay Owens, Elaine Quave, Mike Vatalaro, Frank Vickery, Mallory Wetherell, David Zacharias, and Valerie Zimany) highlight the conceptual and formal range of possibilities with the elemental medium of clay. 100 local artists created original 10" x 10" pieces. Meet your child's art teacher in the Greenville County K-12 Visual Art Teachers Show! All visual art teachers from Greenville County have been invited to exhibit their work in the GCCA Gallery. GCCA Members share their talent in our first annual Member Show. The show is an excellent opportunity for the community to see the breadth and depth of work being created in and around Greenville. Each of the eleven artists shares her feminine perspective in this show entitled "Telling Her Story." The show includes the works of Alice Ballard, Mandy Blankenship, Camela Guevara, Louisa Pyle Kirk, Michele Maynard, Naomi Nakazato, Emily Neal, Michelle Berg Radford, Valerie Zimany, April Harrison, and Suzanne Zoole. Daydreams, identity, motherhood, cultural stereotypes, nature, and technology are some of the themes interpreted in the artwork. Artists in the show: Jay Zerbe of Indiana, Galen Cheney of Vermont, Matthew Dibble of Ohio, Margaret Glew from Canada, Steven Aimone of North Carolina, as well as Katherine Aimone. The premise of this vibrant and bold exhibition of abstract painting is to illustrate that the movement of Abstract Expressionism in New York, which began in the 1940s and lasted into the 50s is still very alive today. Celebrating artistic revelry with artwork from over 40 artists with additional work presented by Palmetto Luna Arts fostering Latino Arts & Culture. "Unseen Greenville" is a juried exhibition focusing on the people and places in Greenville County that often go unnoticed. While Greenville continues to grow and prosper, we often lose sight of the wealth of experiences, places and diversity found below the service. This exhibition will focus on those parts of Greenville which are often unnoticed, but are a vital part of what has made Greenville an amazing place to be.